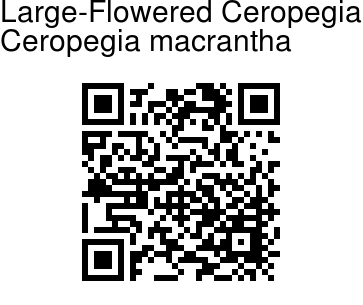 Large-Flowered Ceropegia is an extensive climber with stem twining, and branches hairless or hairy. Leaves are 10-18 cm long, generally ovate- lanceolate, sometimes ovate, hairless or sparsely hairy on both the sides, leaf-stalk 0.6-1.3 cm long. Flowers are borne in stalked many flowered cymes. Flower-stalk is 0.6-2 cm long, bracts subulate. 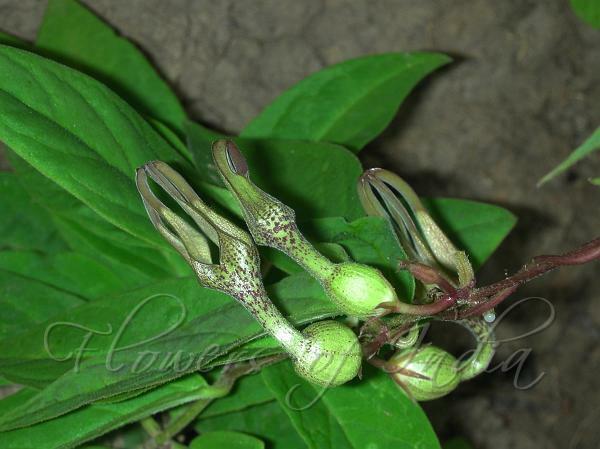 Sepals are 6-7 mm long. Flowers are pale, tube 1.5-3 cm long. Lower about one third part is inflated, then abruptly narrowed for 0.8-2.1 cm before dillating at mouth into an elongated crown. Lobes are 1.2-3 cm long, dull green at base, mottled purple above, with dense brown black tips, purple hairy. Seed pods are 10-13 cm long. Large-Flowered Ceropegia is found in subtropical Himalayas, from Kashmir to Bhutan, at altitudes of 150-500 m.